Remove the stems from the cherry tomatoes. 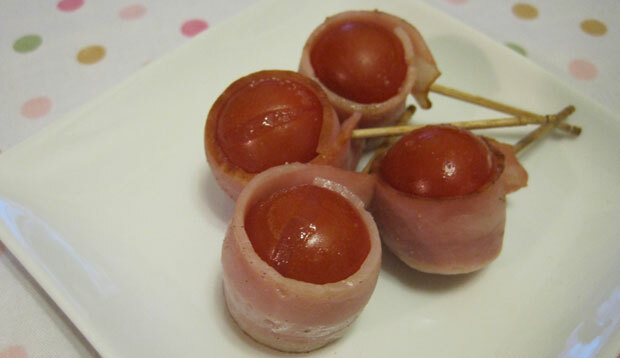 Roll up a cherry tomato in the bacon and insert 1 wooden pick to secure. Make 8 rolls in same manner. Place rolled tomatos on the baking sheet or aluminum foil. Sprinkle with salt and pepper on them. Roast rolled tomatos on the sheet in the hot oven for 5 minutes. Be careful when you eat the tomato right after roasting. Inside the tomato is very hot. Amiable post and this fill someone in on helped me alot in my college assignement. Thank you on your information.